Julie LeFever, former director of the Wilson M. Laird Core and Sample Library on the UND campus, stands in the newly expanded area of the library, during a Monday, Sept. 26 ribbon-cutting ceremony. LeFever recently was posthumously honored for her years of service to the state of North Dakota and beyond. Photo by Jackie Lorentz. When Julie LeFever spoke, people listened. She gave talks to standing-room-only crowds about North Dakota drilling core samples and oil development at national conferences. 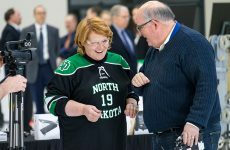 Geologists from oil companies across the nation flew to Grand Forks to visit with LeFever and hear her opinions about core samples and drilling sites. Landowners came to see if there might be oil on their land. Oil executives made drilling investments after visiting with her. And students learned about geology and core samples, later becoming experts in the oil industry. 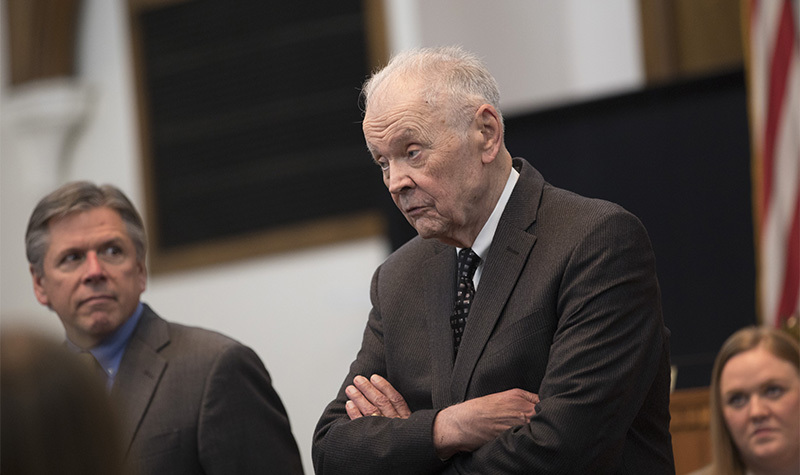 LeFever, who died Dec. 5, directed the North Dakota Geological Survey’s Wilson M. Laird Core and Sample Library on campus for 28 years. Her dedication to preserving and examining core samples from drilling sites in western North Dakota led, many said, to the Bakken oil boom. LeFever will receive the Robert R. Berg Outstanding Research Award posthumously this week from the American Association of Petroleum Geologists at a ceremony in Houston. It will be the second major award she received from the organization. LeFever had an eye on the future, working to study and preserve core samples from drill cuttings. Those samples – 4.4 million tons of rock and counting – can reveal whether or not an area contains oil. The library, which contains the most complete set of cores and samples in the nation, had nearly reached capacity when the 2015 North Dakota Legislature, recognizing its importance, authorized a $13.6 million expansion that added 28,000 square feet and three additional laboratories. One of the laboratories was named after her during the dedication of the building in September. She was surprised – and thrilled. “Julie was the face of the core library,” said Richard LeFever, her husband and professor emeritus of Geology and Geological Engineering. 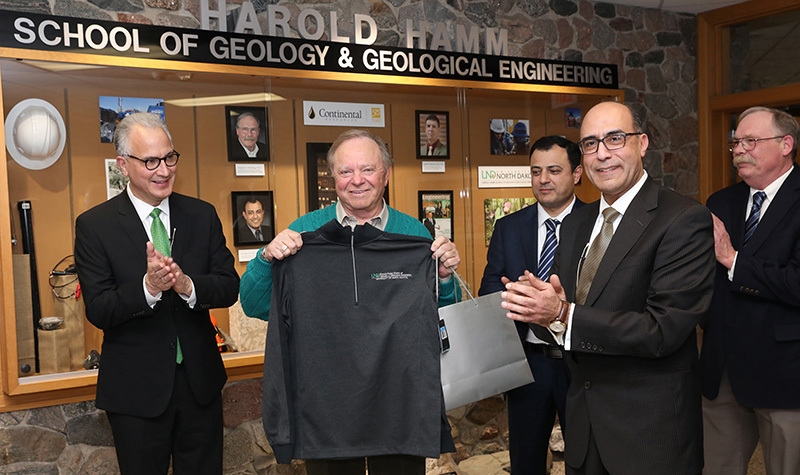 “The oil industry has a very high opinion of her.” He added that Harold Hamm, CEO of Continental Resources, for whom the Harold Hamm School of Geology and Geological Engineering is named, was impressed by the core library, but even more impressed by Julie. 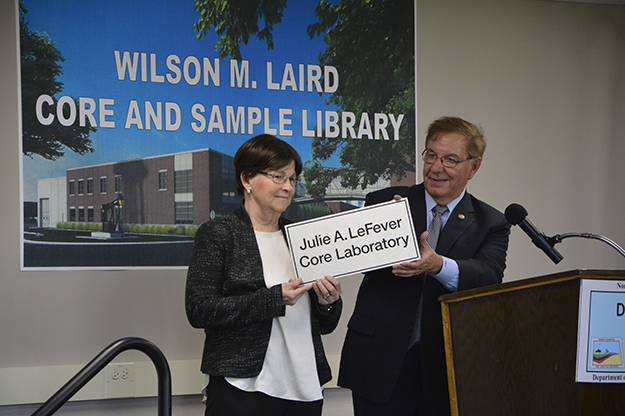 Julie LeFever is recognized by North Dakota State Sen. Ray Holmberg, R-Grand Forks, during a ribbon-cutting ceremoney at the Wilson M. Laird Core and Sample Libray, on the UND campus, where she served 28 years as director before her death on Dec. 5, 2016. Her work earned her the nickname of “Miss Bakken” among those working in the Williston Basin. “The students, professors, scientists and engineers who came through the core library in the last 27 years learned things directly from her as well as from the publications that she authored or co-authored on the oil-bearing rocks in the Williston Basin,” said Ed Murphy, State Geologist with the North Dakota Geological Survey. LeFever wrote her first paper on the Bakken Formation in 1990 and continued writing throughout her career, with more than 150 papers, articles, posters and maps. Some were collaborations with husband Richard or other co-authors. She will be remembered for sharing her work, published and unpublished. “Countless industry geologists, professors and graduate students benefited from Julie’s spontaneous, one-on-one core workshops in the core library,” said Murphy.